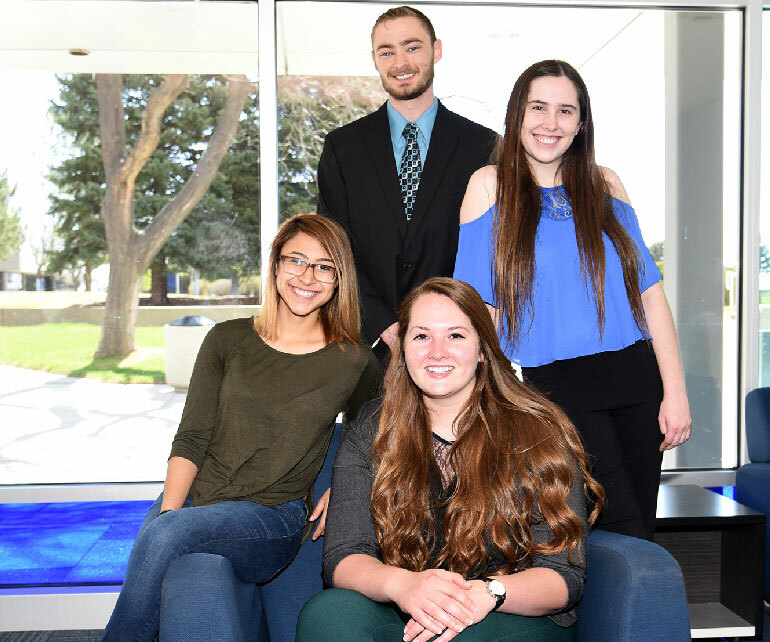 PUEBLO – The Honors Program at Colorado State University-Pueblo has partnered with Pueblo County on four internships for the spring and summer 2018 semesters in the Department of Economic Development and Geographic Information Systems (EDGIS). The student interns receive experience in economic development, Buy Local promotion, energy sustainability programs, and geographic information system skills. Mikala Morris, Tempe, Arizona, spent the spring semester interning with EDGIS focused on the Buy Local program. Morris played volleyball for CSU-Pueblo for five seasons and will graduate in May with three bachelor’s degrees in mass communications, political science, and Spanish with a minor in honors. At CSU-Pueblo, she also worked for the General Education Tutoring Center and TRiO Student Services as a Spanish and political science tutor. She led the school’s chapter of Fellowship of Christian Athletes and interned for AWR Cat Tails Rescue, and the Office of External Affairs. She will attend Arizona State University in the fall as a graduate student in the Walter Cronkite School of Journalism, where she was awarded a Graduate Teaching Assistantship that includes a full tuition scholarship. Lauren Knight, a junior history major from Thornton, Colorado, will intern with EDGIS focused on the Buy Local program and promotions. Knight is pursuing a double minor in creative writing and honors and is completing an internship at El Pueblo History Museum. She was one of two honors students who designed an exhibit on Women Ordnance Workers at the Pueblo Ordnance Depot for the Rawlings Library in March of 2018. Jordan Freed, a senior 3+2 Master of Business Administration student from Vilas Colorado, also has minors in Honors and Leadership Studies. Freed will intern with Pueblo County Energy Coordinator to promote energy efficiency and renewable energy among the residential and commercial sectors by engaging with community stakeholders and providing free educational opportunities, policy recommendations, and energy bill consulting services to Pueblo County. The Energy Office also actively promotes weatherization activity County-wide and works to connect low income residents with energy-related support services. On campus, Freed also is involved in the Associated Students Government, Honors Program, President's Leadership Program, and Residence Life and Housing. Yamel Ramirez, Aurora, Colorado, is a first generation college student majoring in psychology and Spanish with an Honors minor. Ramirez will intern in the EDGIS department to help determine the location and process of using EDGIS data to create products for other departments. This will include creating and maintaining data for the EDGIS department. At CSU-Pueblo, she is a member of Psi Chi, The National Society of Leadership and Success and Sigma Delta Pi. She completed a service learning project with Boys and Girls Club or Pueblo, County where she translated documents from English to Spanish.